On the last month of tenancy does the tenant owe the difference between the current rental rate and original LMR deposit amount or does the LMR deposit entitle the tenant to one month of tenancy regardless of what the current rental rate is? How is the interest owed to the tenant on the LMR deposit calculated? 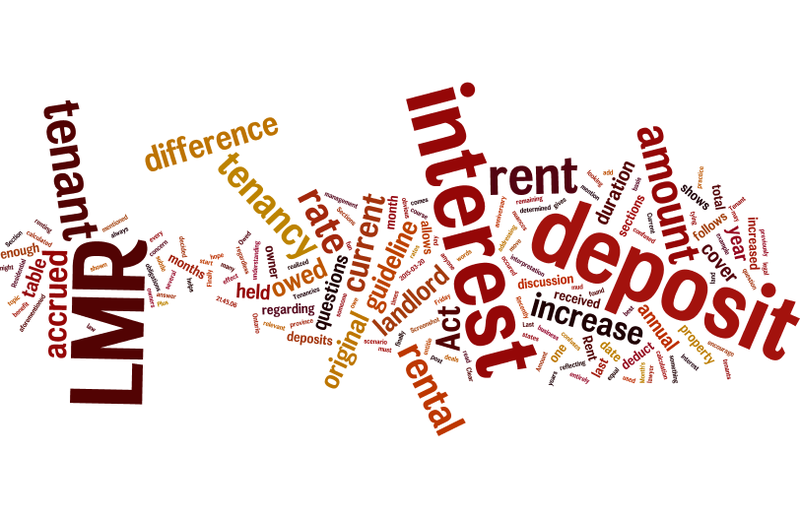 Can the interest accrued on the LMR deposit over the duration of the tenancy be used to cover the difference in the previously mentioned rental rates? Would there be enough interest to cover the difference? After reflecting on our discussion I realized that the owner’s questions were not entirely obvious to someone unfamiliar with the subtle nuances of the Residential Tenancies Act when it comes to LMR deposits. The aforementioned “Act” is the current law of the land that deals with matters regarding the legal obligations of landlords and tenants in the province of Ontario. So in this post I’ll do my best to answer the above questions for the benefit of anyone out there who may be confused about this topic. I should mention that I am not a lawyer, but have been through the LMR scenario many times during the course of our property management business. What follows is my interpretation of sections 105 – 107 of the Act. If you’re looking for something fun to do on a Friday night, I encourage you to to read the relevant sections found here. Let me start by addressing the question of interest owed to the tenant on the LMR deposit held by the landlord. The Act states that the landlord must pay interest to the tenant on an annual basis at an interest rate equal to the rent increase guideline for each year that the LMR deposit is held. In other words, the interest owed for every year of the tenancy is determined by the rent increase guideline rate in effect on the anniversary of the date when the LMR deposit was received from the tenant. The table below gives an example of an interest calculation for a LMR deposit. It shows the date the deposit was received and the accrued interest for each year that the deposit is held. The table shows the Total Interest accrued over the duration of the tenancy. Sections (3) of the Act allows for the LMR deposit to be increased by the amount of the annual rent increase guideline, and Section (7) allows the landlord to deduct the increase from the accrued interest. In practice, we add the accrued interest to the original LMR deposit amount, then deduct the total from the Current Rent amount, as shown in the table. Finally, the amount remaining from the difference between the Last Month’s Rent Plus Interest and the Current Rent is the Amount Owed to Tenant. By tying the interest owed to the tenant to the annual rent increase guideline, the landlord is assured that she will always have enough interest to cover the difference between the current rental rate and original LMR deposit amount. Clear as mud? I hope this helps your understanding more than it confuses you! This is great information not only for landlords but also tenants. In all my years of renting and moving on from one property to the next, I have never been paid the difference of interest earned after factoring the current rental rate. Thanks for your comment Fiona. I’m glad you found it helpful. Judging by the date of your comment, it looks like you agree with me that reading up on the Residential Tenancies Act is good times on a Friday night!